Mondays: 6:30 p.m. to 7:30 p.m.
Every other Friday: 11:00 a.m. to 4 p.m.
• Do you have general/business inquiries or a news tip to submit? Contact the Editor in Chief Emily Burian at eic@thecampanil.com. • Want to write a News story? Have Breaking News to report? Contact the Chief News Editor Marisa Tangeman at Tangeman@thecampanil.com. The Campanil welcomes public commentary on subjects of interest to the campus community, as well as feedback on the paper itself. Letters to the Editor should be no more than 150 words. Submissions may be edited for length and clarity only. All submissions must include the author’s name and contact information and may be submitted via email or in typewritten form, accompanied by an electronic copy. No anonymous submissions will be accepted. Submissions must be received one week before publication date to appear in the next issue. • Want to create a Multimedia project or contribute a Blog post for the website? Did you spot any technical issues? Contact the Online Editor Jeanita Lyman at lyman@thecampanil.com. • Want to advertise with our publication? Contact campanilads@thecampanil.com. Or head over to our Advertising page for more info. Important: The Campanil reserves the right to upload all content published in print, in addition to original content, on our website http://thecampanil.com/. We welcome participation from anyone in the Mills community. Whether you love telling meaningful stories, are passionate about learning and conveying information, curious about the world around you or would just like an outlet to showcase your web, design, writing, photography or drawing skills, we have room for you! Email eic@thecampanil.com to learn more. We also recommend attending our Open Meetings (scroll down for more info). Open Meetings take place every Monday at 6:30 pm and every Thursday at 5:30 pm in The Campanil newsroom at Rothwell 157 and are welcome to the Mills community to attend. You can come pitch a story idea and/or pick up a story to write for us if you’re interested in becoming a staff writer or photographer. We ask everyone to put away your phones and to not conduct private conversations for the duration of the meeting. Please note: The Campanil cannot cover everything but we will help you post about upcoming events and lectures on both our Facebook and Twitter pages. 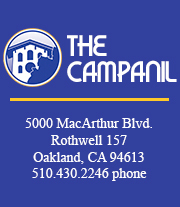 For more information about The Campanil, visit our About Us page.